It was with extreme regret that I learned of the passing of yet another great in the history of Montana sapphire. I was first introduced to Marc in 1994 by Tom Lee, and when my family and I paid a visit to his sapphire property at Dry Cottonwood Creek, he was most eager to show us around. Descending on a tailings pile, my eagle-eyed daughter, Billie, just five years' old at the time, immediately snatched up a fine yellow sapphire. Marc, in his generousity, graciously allowed her to keep it even though it would have easily cut a stone of more than one carat. Marc Bielenberg as a young man. In the succeeding years, I often corresponded with Marc. His letters were often accompanied by samples of sapphire with unusual inclusions or features. I was sad to learn recently of Marc's passing. He had died in his sleep on Feb. 25, 2011, aged 91. Any history of sapphire in Montana would be woefully incomplete without mention of Marc Bielenberg. Although personally involved with mining at Rock Creek and Dry Cottonwood Creek, the breadth of his work stretches far beyond those bounds. Indeed, the history of Montana itself is inextricably intertwined with the Bielenbergs, one of the state’s true ‘pioneer’ families. They were deeply involved in Montana’s early development as an important min­ing territory, but also played a role in agriculture and ranching. The legendary Grant-Kohrs Ranch near Deer Lodge, now a US national historic site, was developed by Con Kohrs & the Bielenberg family. Marc first began promoting Montana sapphire in 1936 at the World's Fair. For more than half a century, Bielenberg—as miner, prospec­tor, gemological researcher, archivist, historian and teacher—has worked tirelessly to educate the world about Montana’s unique deposits, the quality of the stones, and the lore and legends surrounding their early discovery and mining. It is not an exaggeration to say that every mining company and indi­vidual involved with Montana’s sapphires today owes Marc Bielenberg a professional debt of gratitude and appreciation. When he was 80 we spent two weeks on horseback in the mountains so he could show me all of his high grade gold discoveries, so I could develop them after he was gone. 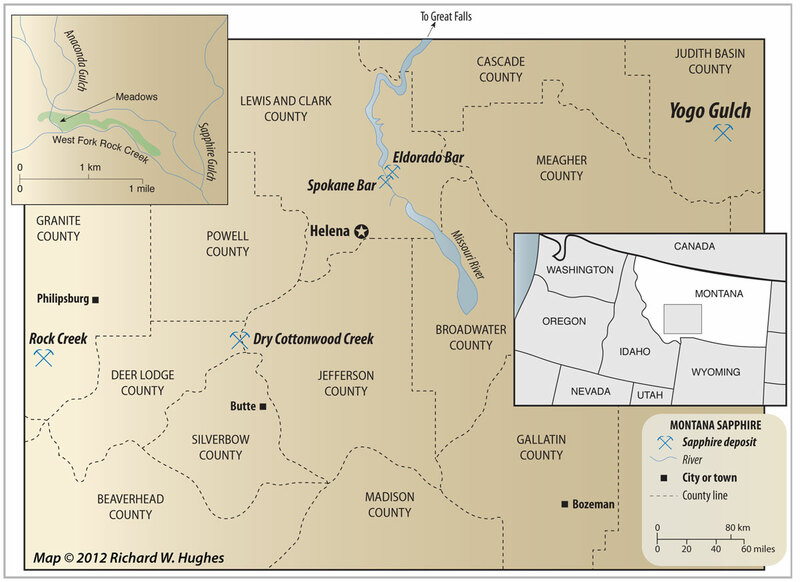 Map of central Montana showing the location of the Marc's Dry Cottonwood Creek mine. Click on the map for a larger image. Marc Bielenberg is survived by his daughter, Claudia (Lloyd) Thorsrud. For more on Marc Bielenberg, see the obituaries below. Anonymous (2011) Robert 'Marc' Bielenberg. Missoulian, Missoula, MT, March 8. Anonymous (2011) Robert 'Marc' Bielenberg, 91. Silver State Post, Deer Lodge, MT, March 16. Views expressed in this article are the authors' opinions alone and do not necessarily reflect the opinions of any organization that employs them. Those organizations bear no responsibility and assume no liability for content on this website, nor are they liable for mistakes or omissions.